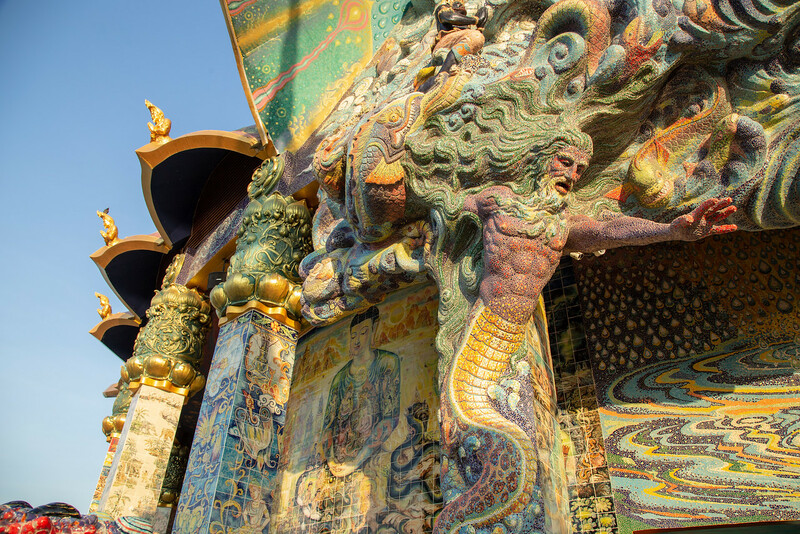 The first thing you notice about Wat Ban Rai, also known as the “Elephant Temple,” a temple in Thailand’s Dan Khun Thot district is how immense it is. You may feel like you have gotten lost in your travels in the Thai countryside on your quest to see this colossus, which is located about 60 kilometers outside of Nakhon Ratchasima (Korat), near the town of Kut Phiman, Thailand, but once you see the 42-meter-high, four-story Thep Wittayakom Vihara, with its 520-ton ceramic elephant head on the body of a turtle, there is no doubt you have arrived. The highly venerated abbot of Wat Baan Rai is Luang Phor Koon, who recently turned 90, that teaches the simplest understanding of the dhamma is best and, even though on the surface his is one of the most spectacular modern Buddhist temples in existence, the Elephant temple belies a remarkably simple way of teaching the Tipitaka, the daunting three-volume canon that contains the 84,000 teachings of the Buddha Siddhartha Gautama. 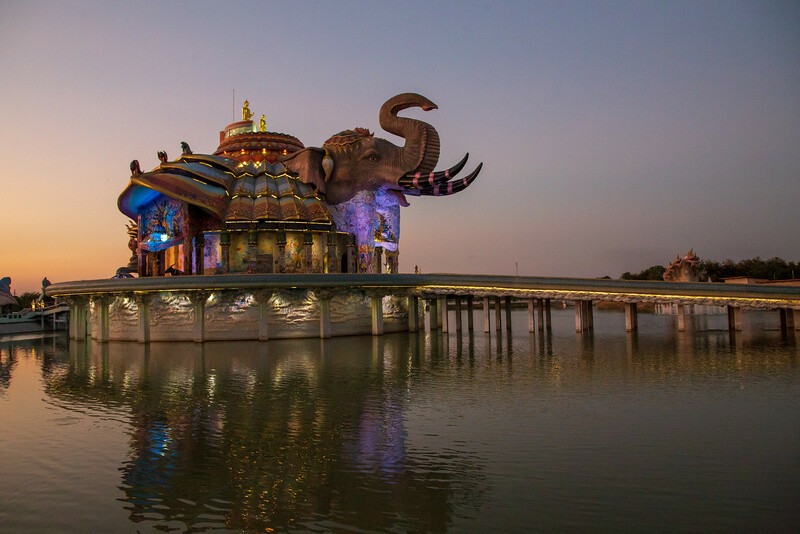 The temple was designed by Samphan Sararak and construction of the temple, as well as the elaborate mosaic work, was carried out by over 400 local villagers, overseen by Kriengkrai Jaruthavee who watched every step of the temple’s construction through a telescope from 200 meters away. The building of the temple was a meticulous process where one person could attach no more than a square meter of ceramic a day. 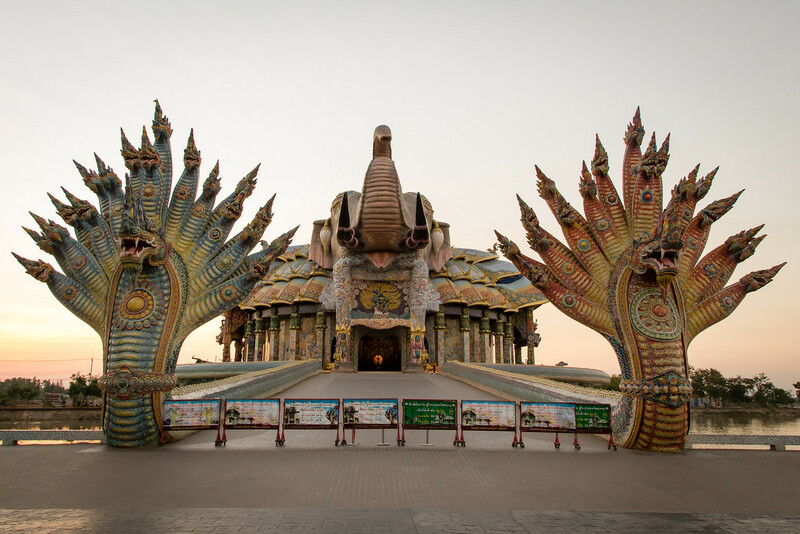 The Wat Ban Rai is surrounded by water and you enter via a long bridge which is guarded by two 19 headed nagas. 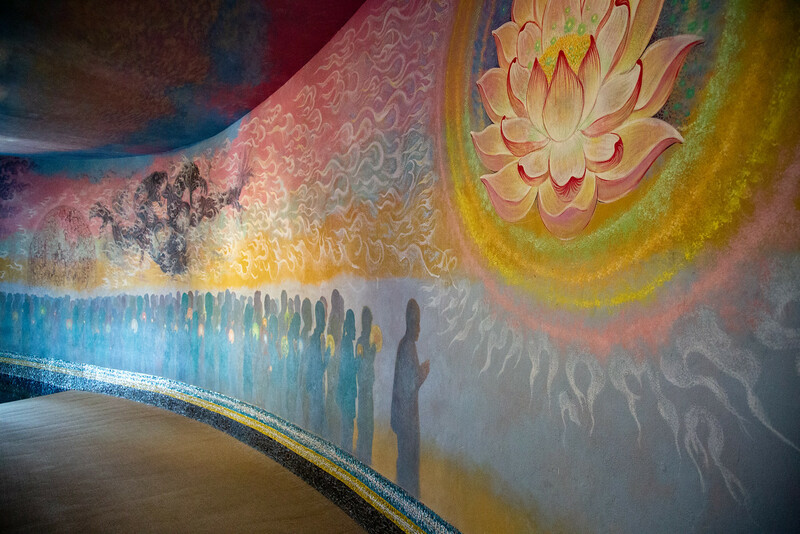 On the first floor are six huge paintings that depict the Buddha’s life from birth to enlightenment. From there a carpeted, wheel-chair assessable, ramp winds upward four stories. 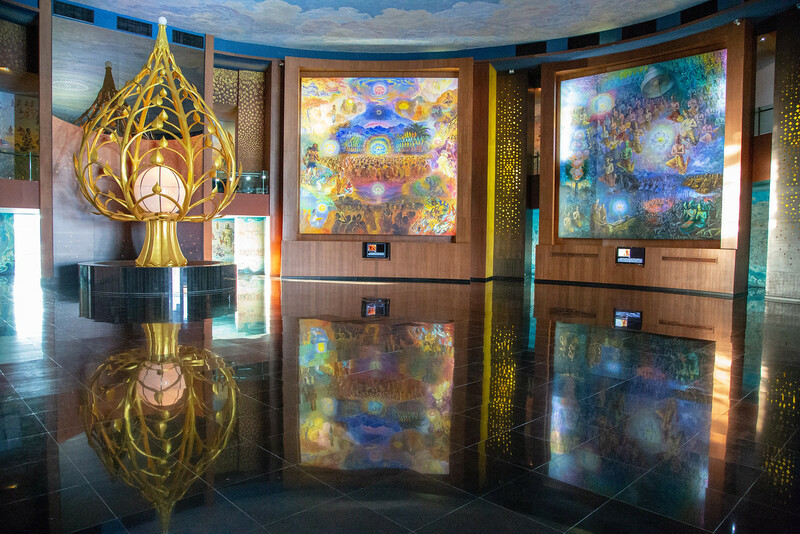 You will see hundreds of mixed media artworks depicting the history of a teaching of Buddhism. Upon reaching the top you are greeted with an open-air patio that gives extraordinary views of the countryside and Wat Ban Rai. You will share the view with two bronze statues, a seven-meter-high Buddha and a five-meter tall sculpture of Luang Pho Koon also looking of the scene. I had been very impressed with another of Thailand’s modern temples, Wat Rong Khun more commonly known and “The White Temple” and when a friend showed me a photograph of the Elephant Temple I couldn’t wait to see it. Kut Phiman isn’t the easiest place to get to but Sarah and I decided to make a detour on our adventure from running the Angkor Wat Half Marathon in Siem Reap, Cambodia on our way to Vientiane, Laos to see it. That I had just “invested” in a DJI Phantom 2 drone for doing aerial video and photography and I was looking for unusual places to practice flying and making photos MAY HAVE a has little to do with it as well. 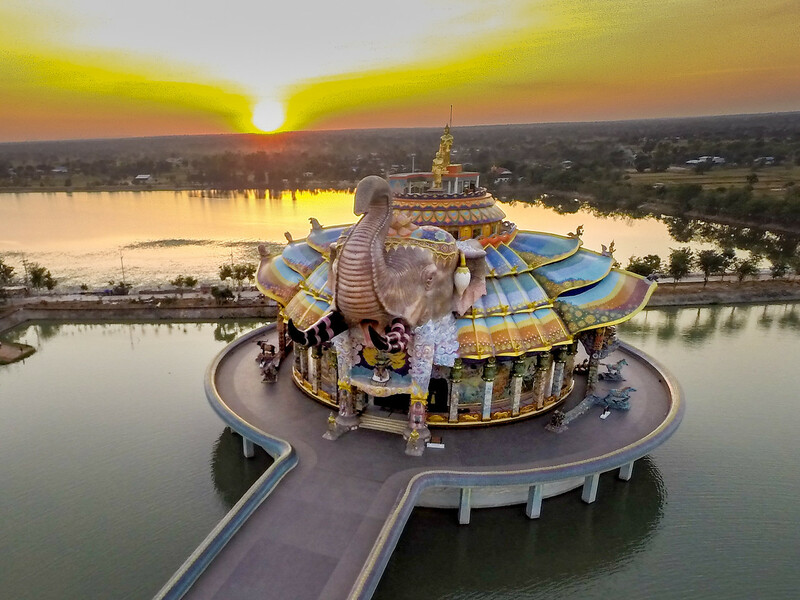 After touring the Elephant Temple I (of course) asked permission to see if I could fly the drone. I got an enthusiastic yes! I shot two full batteries of video and a battery of still shots as well. It was late in the day, there were no monks in residence. Most of the tourists had gone home and the sun was setting; it was perfect! Entrance fee: Free, but expect a donation. There is a gift shop where you should be able to pick up a LP Koon amulet. How to get there: The nearest main town is Nakhon Ratchasima City (Korat) which is easy to get to by bus or train from Bangkok. From there you will need to rent a car/motorbike or take a taxi. Phenomenal! Wow just isn’t enough. It definitely looks worth the detour! I would love to see this type of architecture in the US. Our’s is so blah. Very cool photos and post. 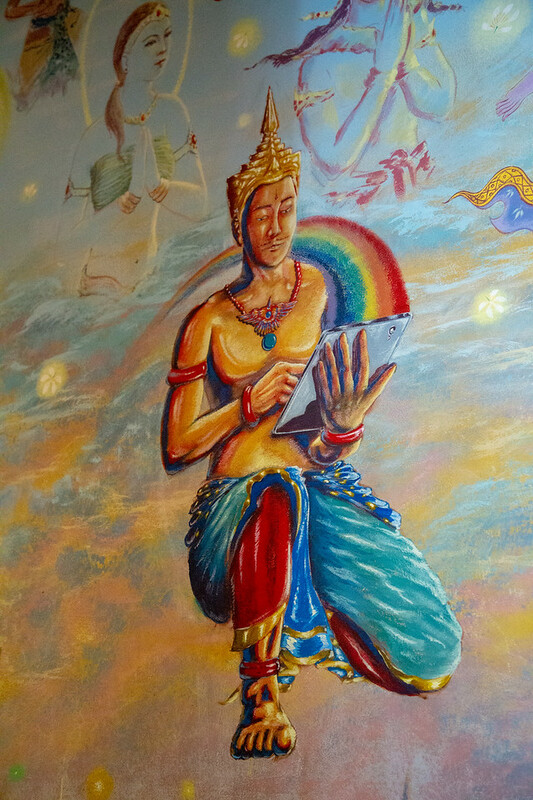 I’ve been to Thailand a few times and have not heard of this temple, but now I want to go see it! May have to figure out how to make a side trip to Korat on my next visit. The Drone photo gives a great perspective.